I’m thrilled to have author Tricia Drammeh back for another interview. She’s branched out with some new and exciting work in her novel, Better than Perfect, and has started a new series, The Seance, in the YA Paranormal genre. You’ve been busy since last you were here! What helps you be so prolific?! I don’t really consider myself to be a prolific writer. If anything, I’m quite the procrastinator. I can share one tip with you. I’ve recently teamed up with a friend and we keep each other motivated. We have to write 200 words every day, which might not sound like a lot, but I’ve found that once I complete my requisite word count, I’m often in the mood to keep writing. And if I do decide to stop at 200 words? At least I feel as if I’ve accomplished something. It’s worked well so far. You mentioned last time that the characters for a series spring to your mind first, demanding that you tell their story. As you move from book one to the other books, what surprises you about the process? Each book in a series can be more difficult to write than the one before. With each new book, I refer back to earlier books to make sure the overall plot from the series makes sense. While I’m able to wing the first book, subsequent books require a little more plotting and planning. Tell us about some of the books you’ve written and who would enjoy them. 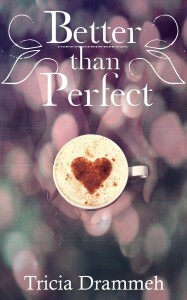 I recently released a standalone novel called Better than Perfect. It falls into the chick-lit category and would be enjoyed by both the New Adult audience and contemporary romance lovers. The Séance is a paranormal novel for young adults. It’s the first in a series and would appeal to anyone who likes to be scared out of their wits. That would be me! What do you think makes for great fantasy fiction? Anything and everything! When writing fantasy, the sky’s the limit. From dragons to witches to mystical beings created from your own imagination, anything goes when it comes to fantasy. Who are some of your biggest influences as a writer? I love Anne Rice, Stephen King, J.K. Rowling, Marian Keyes, to name just a few. Wow. Good question. I think my favorite would have to be Samwise Gamgee from Lord of the Rings for his loyalty, courage, and appreciation for the simple things in life. He isn’t the slightest bit tempted by anything the ring has to offer because he already knows true happiness. I’m currently working on a YA romance called Sweet Sorrow. I’m also hoping to complete the sequel to The Séance this year. Thanks so much for joining, us Tricia! Readers can follow you and purchase your books at the links below! Twenty-three-year-old Karlie is in the type of rut some people never escape from. With few friends, no boyfriend, and no plans to graduate from college any time in the immediate future, Karlie is as stuck in her ways as the elderly neighbor she spends all her time with. When her world is invaded by two surly twins bound for criminal court, a too-good-to-be-true love interest, and a cute cop who keeps showing up at the most inopportune moments, Karlie can either fight against the changes in her life, or embrace them. Tricia Drammeh is a wife, a mother of four children, and an author. She lives in New Hampshire with her family. When she isn’t writing, she can be found devouring books, chasing cats, and consuming vast amounts of coffee. This entry was written by A. R. Silverberry, posted on June 25, 2014 at 3:22 pm, filed under Author Interview and tagged Better than Perfect, New Adult, New Adult Fiction, The Seance, Tricia Drammeh, YA Fiction, YA Paranormal, Young Adult, Young Adult Fiction, Young Adult Paranormal. Bookmark the permalink. Follow any comments here with the RSS feed for this post. Post a comment or leave a trackback: Trackback URL. Thank you so much for featuring me on your amazing blog. I loved answering your questions. So much fun! Any time, Tricia! We’ll have to do it again for the next book!